This morning our baseball team beat last year’s national championship team – Lubbock Christian University by a score of 3-2. This was a big win! Monday morning at 10:30 central time, we will play Embry-Riddle Aeronautical University from Daytona Beach, Florida. One of Belhaven’s great legacy faculty members passed away this morning. Mary Harmon was a remarkable servant for the Lord, and we are especially thankful that she dedicated her life to God’s work here at Belhaven. That Tartan article can be found HERE. The National Softball Championship was won this afternoon by Simon Fraser University in British Columbia. SFU is a public university of 32,000 students. We lost to them in the opening round of the Elite Eight, by a score of 4 – 2. And with some breaks the other way, we could have won that game. Our Baseball team flew out yesterday for Lewiston, Idaho. Their first game will be Friday at noon (1 pm central time). • Won the Gulf Coast Athletic Conference Regular Season Championship and was the No. 1 seed in the Gulf Coast Athletic Conference Tournament. • As a team, Belhaven leads the NAIA in total triples with 39 and has 222 total extra base hits, including 51 home runs heading into the World Series. • Shawn Diehl and Drew Dillard top the team with eight triples apiece, good for fourth in the NAIA. • Timmy Foster has 30 doubles on the season, which is first in the NAIA and set a Belhaven single season record for most doubles in a season previously held by Thomas Royals who had 25 in 2007. • Belhaven pitcher Brandt Hinton is third in the NAIA in wins with 12 and Wade Broyles is third in the nation in saves with 13. • Head Coach Hill Denson also surpassed the 1,000 win mark for his coaching career. The win total includes games at the collegiate and high school levels. He is 822-629-2 in 24 years of collegiate coaching. • Blazers ended the season ranked No. 14 in the Coaches’ Top 25 Poll — reached as high as No. 10 on two occasions. • Team averages 8.4 runs per game and has been close to that mark in its last 10 games averaging 8.3 runs. • Making first appearance in the World Series and is playing in its second NAIA postseason making it to the 2009 National Championship Opening Round. • Is the first team from the Gulf Coast Athletic Conference to make the World Series since 2003 when LSU-Shreveport went 3-2. Our women played two tough games in the elite eight bracket of the national championship tournament in Decatur, Alabama this afternoon. They won the first over Trevecca Nazarene University, but lost the second by one run to William Carey University. That loss put them out of the tournament. Interestingly, we beat William Carey 4 of 5 games during the regular season, but they beat us twice in the conference tournament three weeks ago. And while we hate to end the year on a loss, we must be celebrating all this team has accomplished. The records they have set a whole new standard for this program. Congratulations to this team of exceptional players! Congratulations to Head Coach Rick Fremin – who was voted Coach of the Year by the Gulf Coast Athletic Conference. – and our Assistant Coaches Alana Fremin, Mallory Meadows, and Shaunte Fremin. They have put Belhaven Softball on the national map. I told the team right after their loss, that they have gone farther in Belhaven national competition than any other team in our history, other than the year we won the national championship in soccer and the tennis team that won the national championship. To be the 5th best team is the country is a tremendous accomplishment. When competing at this level, only one team goes home happy – when they win it all. But let’s not keep this loss today from celebrating this historic softball season of success. Here is a picture from my phone of a couple of the loyal fans. I was especially glad to see how great parents were there to support this team today. Of all the teams competing, we had more parent support than most of the other schools combined. Our softball team swept their pool play with big wins and now we move onto the final 8 teams competing for a the national championship. We could win this thing!!! They start their first game in just a few minutes (9 pm central) against Simon Fraser from British Columbia. You can follow it live on the internet HERE just scroll down to our game – Game #3. WHEN we win tonight, the Blazer will next play tomorrow at noon (and if we lose, we also play tomorrow at noon in the bottom bracket). I’ll be in Decatur for that game tomorrow and through the end of our national championship march. 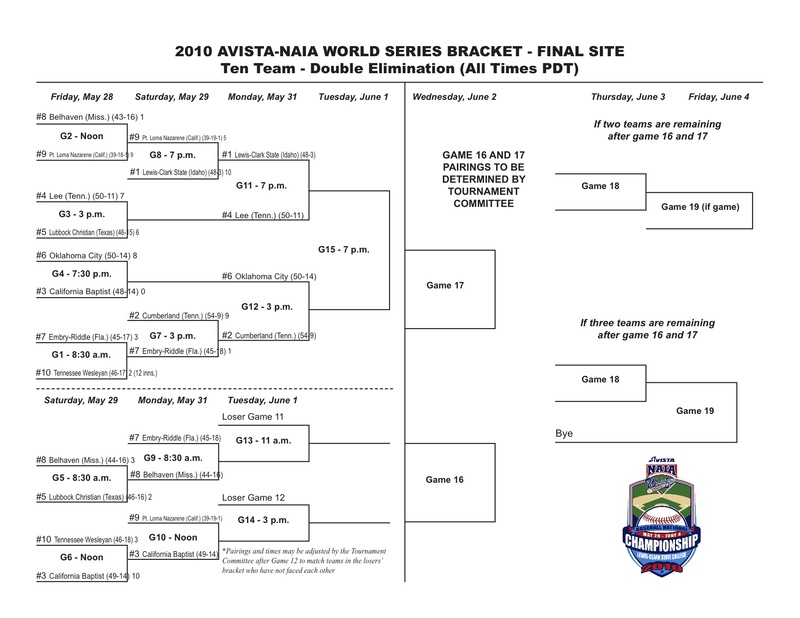 Here is the double elimination bracket….all the games can be followed on the web. What a memorable moment around 10:30 pm at Smith Wills last night – after a two hour rain delay the Blazers beat Texas Wesleyan 4-3 to earn the program’s first trip to the World Series in Lewiston, Idaho. We learned late today that we are the #8 seed in the 10-team bracket and open play vs. #9 seed Point Loma Nazarene at noon (Pacific Time) on Friday, May 28. You can follow all Belhaven World Series games online with Live Stats and Audio that will be found at the schedule link below. 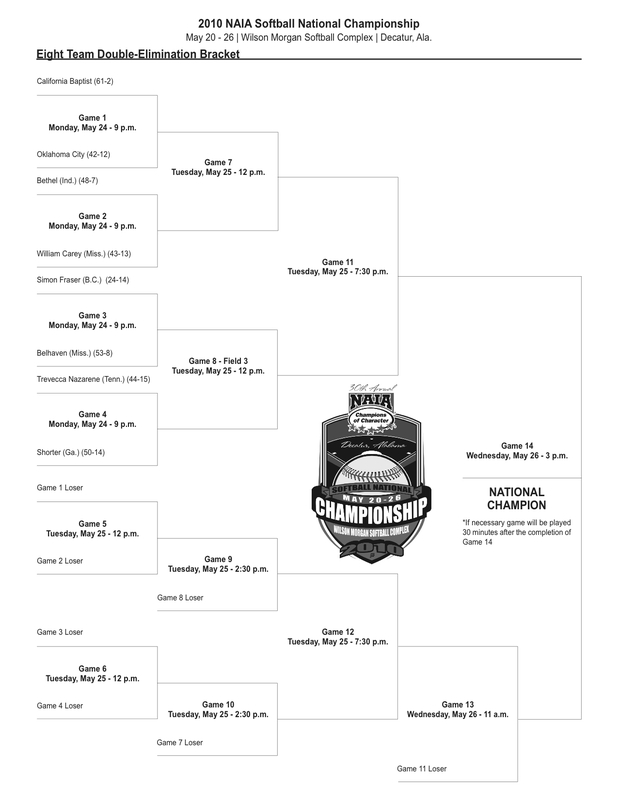 I know you’ll also enjoy the video recaps below from two of our local television stations – plus the attached World Series bracket. Thanks for your support of Coach Denson, Coach Smith and our record-setting Baseball Blazers! This afternoon we hosted guests from Kosin University in Busan Korea for a signing of a sister school partnership we’ve been developing during the past year. Kosin is a strong Presbyterian school of 5,00 students. They build a understanding of vibrant faith into all their curriculum and teach from a Reformed perspective. In many ways, they are like a Korean version of Belhaven. 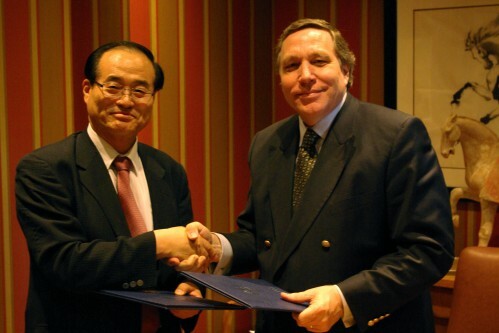 Along with Belhaven, they have partnership arrangements Daystar University, Kenya; Dordt College, USA; Mongolia International University, Mongolia, along with four universities in China. They have some wonderful exchange opportunities for our undergraduate students, and they offer in English both an MDiv and Master of Christian Education. Below is the picture of one of their board members, Rev. Bae, exchanging the agreement today. Joining Rev. Bae were his wife and two of his three sons – all three of which are studying at RTS here in Jackson. Our baseball team has just made history, by beating Texas Wesleyan 4 to 3 a few minutes ago to win the SE Regional Tournament and earn a ticket to the NAIA College Baseball World Series. We started playing baseball in 1959 and this is our FIRST World Series appearance. We will play our first game of the series on Friday next week in Lewiston, Idaho, hosted by Lewis-Clark State College. This is a ten team, double elimination tournament. The games will be broadcast over the internet. Congratulations to Head Coach Hill Denson and Assistant Head Coach Clay Smith. This is a remarkable athletic year with three teams earning a trip to their national tournament – men’s baseketball, softball, and now baseball. In athletics, losing builds character . . . but winning is fun! Tomorrow night our Baseball team will play for the championship of the SE Regional Tournament – and if they win, a ticket to the NAIA World Series in Idaho. The game will be at Smith-Wills Stadium at 6:30 pm. We’ve arranged for all Belhaven faculty, staff and students to receive Championship Day admission for $1 with a Belhaven ID. Should we not win (but we will), then we have a second opportunity to take the championship the next night as this is a double elimination tournament. Although not as close to home for us all to attend, our softball begins their national championship competition tomorrow night at 7:30 in Decatur, Alabama. It seems as if my last couple of posts to the blogs did not get distributed to those of you who are kind enough to be subscribers to my blog. 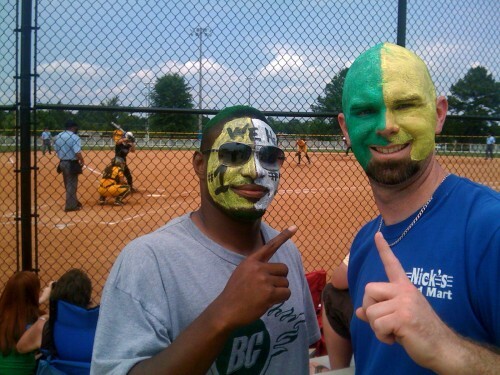 Both our softball coach and baseball coach were named coach of the year. Some observations from the President of Butler University on academic quality and athletic success.